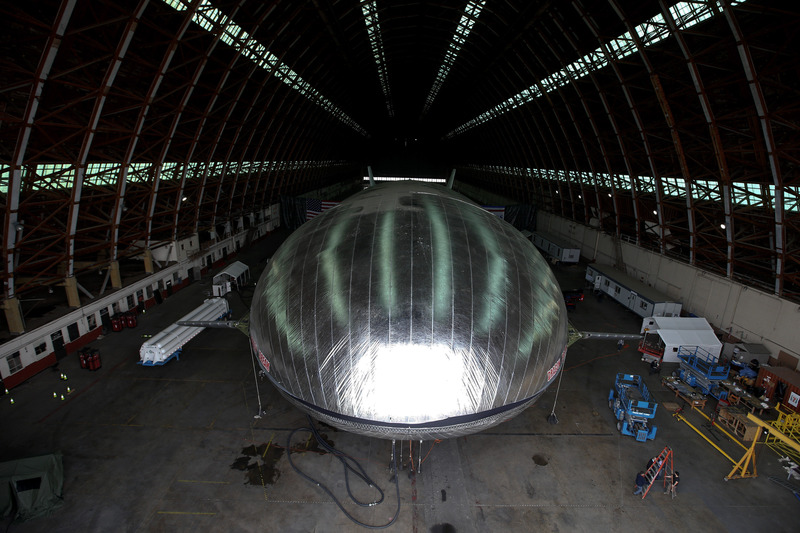 The massive blimp-like aircraft flies but just barely, hovering only a dozen feet off a military hangar floor during flight testing south of Los Angeles. Still, the fact that the hulking 230-foot-long Aeroscraft could fly for just a few minutes represents a step forward in aviation, according to the engineers who developed it. The Department of Defense and NASA have invested $35 million in the prototype because of its potential to one day carry more cargo than any other aircraft to disaster zones and forward military bases. "I realized that I put a little dot in the line of aviation history. A little dot for something that has never been demonstrated before, now it's feasible," said flight control engineer Munir Jojo-Verge. The airship is undergoing testing this month at Marine Corps Air Station in Tustin, and must go through several more rounds of flight testing before it could be used in a disaster zone or anywhere else. The first major flight test took place Jan. 3. The biggest challenge for engineers is making sure the airship will be able to withstand high winds and other extreme weather conditions, Jojo-Verge said. Worldwide Aeros, the company that developed the aircraft, said it also must secure more funding for the next round of flight testing, but is hopeful the Defense Department and others will step in again as investors. The lighter-than-air vehicle is not a blimp or a zeppelin because it has a rigid structure made out of ultra-light carbon fiber and aluminum underneath its high-tech Mylar skin. Inside, balloons hold the helium that gives the vehicle lift. Unlike hydrogen, the gas used in the Hindenburg airship that crashed in 1937, helium is not flammable. The airship functions like a submarine, releasing air to rise and taking in air to descend, said Aeros mechanical engineer Tim Kenny. It can take off vertically, like a helicopter, then change its buoyancy to become heavier than air for landing and unloading. "It allows the vehicle to set down on the ground. And then when we want to become lighter than air, we release that air and then the vehicle floats and we can allow it to take off," Kenny said. The project has set abuzz the old hangars at the Marine Corps Air Station in Tustin. The structures were built to hold blimps during World War II. Now workers zip around in cherry-pickers, and the airship's silvery surface shines against the warm tones of the aging wood of the walls. "You could take this vehicle and go to destinations that have been destroyed, where there's no ports, no runways, stuff like that. This vehicle could go in there, offload the cargo even if there's no infrastructure, no landing site for it to land on, this vehicle can unload its whole payload," said Kenny. The prototype isn't intended to carry cargo, though a similar-sized craft could haul about 30 tons. Aeros wants to build a full-size 450-foot-long vehicle that can carry 66 tons of payload.